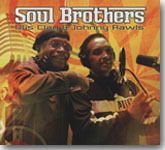 Blues/soul legends Johnny Rawls and Otis Clay team up for their second collaboration, the excellent Soul Brothers. It's our Pick Hit for the month. Our Surprise pick for the month teams up brothers Dave Alvin & Phil Alvin for their first joint recording since 1985 with a tribute to the music of Big Bill Broonzy. Blind Pig Records pulled together cuts from three of Jimmy Thackery's early albums to release the very good Extra Jimmies, making it a good choice for this month's Flashback feature. Our What's New section features reviews of new CDs from Devon Allman, Mississippi Heat, Linsey Alexander, Rob Stone, Duke Robillard, JW-Jones Band, Murali Coryell, Chris O'Leary, Zoe Schwarz Blue Commotion, Liz Mandeville, and more.